​The Hershey Company has been feeling the pinch over the last several years trying to fill maintenance and manufacturing roles at its plant in Stuarts Draft, Va. Manufacturing—and the perception of it as a viable career option—has changed a lot since the plant was first built in 1982 to produce Reese’s Pieces. Hershey’s story is not unique; too many workers across industrial sectors lack the skills needed for critical jobs. To close this gap, employers and workers need to change how they think about work and the skills needed to do it. The U.S. economy experienced solid growth in 2018, along with record-low unemployment, increased productivity and improved consumer confidence. 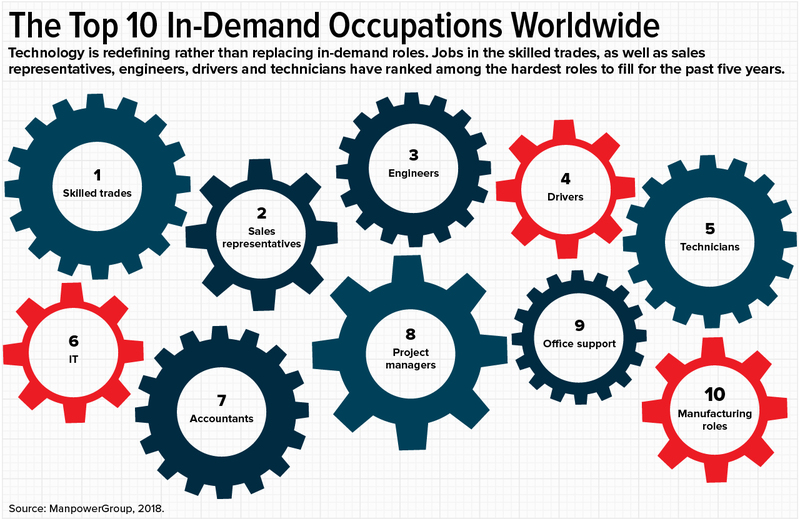 Strong employment gains and a high demand for talent has stretched an already tightened supply. HR is leading the search for the small number of qualified candidates available to hire, increasing pay to attract talent, refocusing on retention and succession planning, and heightening the urgency around employee development. “We’ve got to cast our net into different pools where we’ve never fished before,” Taylor said. “We don’t have the luxury of leaving out significant portions of our population.” Those different pools include people with criminal records, people with disabilities and people who have paused their careers to care for family members. Hershey developed a program called Abilities First, for workers in manufacturing who have disabilities. It emphasizes equal pay, equal work and equal expectations. One of the company’s greatest successes has been converting many production lines to accommodate deaf workers. Supervisors and managers have been trained in sign language, and machines that were outfitted with bells and buzzers were adapted to use different colored lights instead. Widen the top of the recruiting funnel by cutting requirements in job ads to what’s truly essential—tossing out education and experience nice-to-haves—and hiring for fit rather than technical mastery of the role. “Finding the best, qualified people irrespective of an arbitrary barrier such as a bachelor’s degree forces us in HR and hiring managers to ask what the person needs to be able to do in the job, and hire for that,” Taylor said. Recruiting outside of the local labor market and in parts of the country where there is a surplus of workers. “You’ve got to go where the talent is,” Axenson said. Increase flexibility and remote work options to attract those workers. “Surveys consistently find that when it comes to recruitment, retention and job satisfaction, cash is king,” said Julia Pollak, a labor economist at ZipRecruiter, an online employment marketplace based in Santa Monica, Calif. Pollak explained that over the last year, employers have started competing for candidates by increasing bonuses and benefits faster than they increase salaries, cautiously preserving the flexibility to dial the perks back if the economy experiences another downturn. Axenson said competitive compensation is important but that paying people more is only part of the puzzle. “I think workers care tremendously about learning and development opportunities, and creative career paths matter just as much,” she said. Hershey identifies high-potential talent in digital technology, manufacturing and leadership early on and places those individuals in accelerated development to not only jump-start its employees’ careers but also build its own capabilities. Ho explained that rotation programs are often associated with better success, but very few companies use them because employees fear that time away from their job is damaging to their career, and managers aren’t eager to give up their workers for a protracted period. 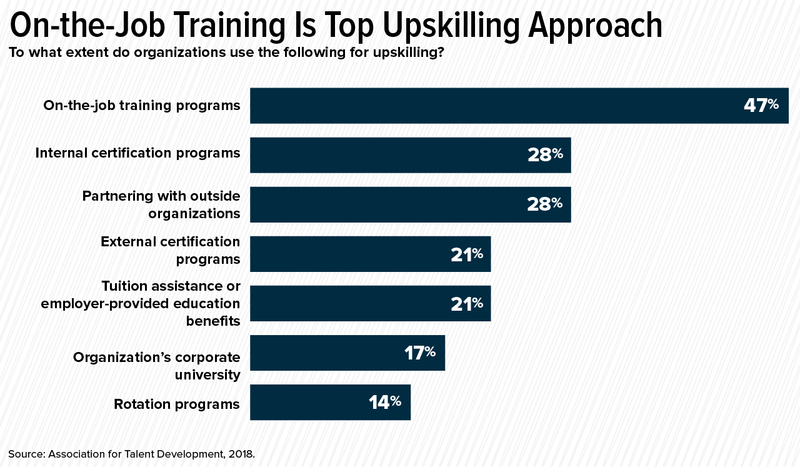 The National Retail Federation Foundation and large retailers such as Macy’s and Walmart created a training and credentialing program that helps people acquire skills needed for a range of retail jobs, including customer care, sales and merchandising, and workplace safety. Amazon’s Career Choice tuition assistance program helps fulfillment center employees pursue certificates and degrees in high-demand fields. The company went further and constructed dedicated classrooms at its large fulfillment centers to make learning more accessible to participants who may attend class before or after their work shifts, or on days off. Hershey invests in colleges and universities to develop relationships with students and faculty to help identify top talent, teach classes, offer seminars and internships. “When it’s time to graduate, we have offers in hand. It’s an easy way to curate a deep bench of prospective talent and helps us address the skills gap,” Walling said. Alternative education models have emerged to meet employers’ growing demand, including sector-based technology “boot camps” offering training in coding, design and other digital skills applicable in fields as diverse as health care and marketing. TechHire for example, is a national network of communities, educators and employers that provides tech training to people who don’t have college degrees. In Greensboro, N.C., employers and education providers have created a manufacturing partnership to develop a pipeline of skilled employees for the region’s advanced manufacturing industry, Howze said. The National Fund site in Cincinnati is working with the University of Cincinnati to provide pre-apprenticeship training in health care to ensure that individuals are prepared to succeed in an on-the-job learning environment. Hershey’s Industrial Manufacturing Technician apprenticeship is an 18-month program that includes on-the-job training and more than 200 hours of instruction. Upon completion, apprentices become journeymen, a nationally recognized credential certifying their expertise in the job.